390 pages | 46 B/W Illus. Meat and dairy production and consumption are in crisis. Globally, 70 billion farm animals are used for food production every year. It is well accepted that livestock production is a major contributor to greenhouse gas emissions. The Food and Agriculture Organization of the United Nations (FAO) predicts a rough doubling of meat and milk consumption in the first half of the 21st century, with particularly rapid growth occurring in the developing economies of Asia. What will this mean for the health and wellbeing of those animals, of the people who consume ever larger quantities of animal products, and for the health of the planet itself? The new edition of this powerful and challenging book explores the impacts of the global growth in the production and consumption of meat and dairy, including cultural and health factors, and the implications of the likely intensification of farming for both small-scale producers and for animals. Several chapters explore the related environmental issues, from resource use of water, cereals and soya, to the impact of livestock production on global warming and issues concerning biodiversity, land use and the impacts of different farming systems on the environment. A final group of chapters addresses ethical and policy implications for the future of food and livestock production and consumption. 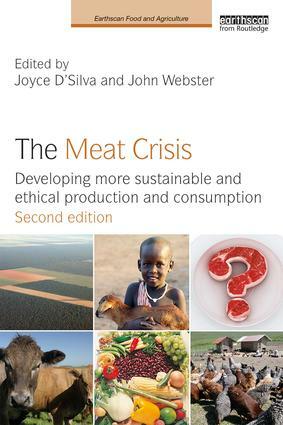 Since the first edition, published in 2010, all chapters have been updated, three original chapters re-written and six new chapters added, with additional coverage of dietary effects of milk and meat, antibiotics in animal production, and the economic, political and ethical dimensions of meat consumption. The overall message is clearly that we must eat less meat to help secure a more sustainable and equitable world. 6. Does organic farming offer a solution? 14. How much meat is optimal for health? Joyce D'Silva worked for Compassion in World Farming from 1985 to 2016, including fourteen years as Chief Executive. She now does consultancy work. She lectures internationally and has published widely on farm animal welfare, including co-editing 'Animals, Ethics and Trade' (Earthscan, 2006). She has been awarded honorary doctorates by the Universities of Winchester and Keele, UK. John Webster is Professor Emeritus at the University of Bristol, UK. He was a founder member of the Farm Animal Welfare Council and is a former President of both the Nutrition Society and the British Society for Animal Science. His books include 'Animal Husbandry Regained' (Routledge, 2012), 'Understanding the Dairy Cow', 'Animal Welfare: A Cool Eye towards Eden', and 'Animal Welfare: Limping towards Eden'.